Exeggcute in game: 3,997 Who? Important notice! Pokemon Exeggcute is a fictional character of humans. 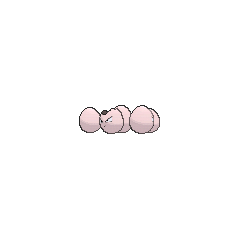 Exeggcute is a Pokémon resembling six light pink eggs, usually seen arranged with five heads huddled around a sixth. Each "head" has a slightly different facial expression, but each face has triangular eyes with tiny black pupils and a small mouth. Each shell has some cracks, and one member of the bundle usually has its yolk or brain exposed. 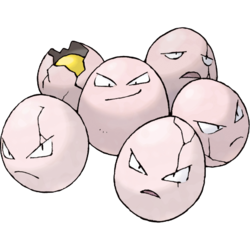 Despite looking like eggs, Exeggcute is actually more closely related to plant seeds. Exeggcute inhabit jungles and forests. Exeggcute gathers in swarms of six. The heads communicate with each other by using a form of telepathy that only they can understand. Should the number of Exeggcute be reduced to less than six, the remaining Exeggcute will attempt to replace it with a similarly sized Pokémon as seen in the anime. Exeggcute and its evolved form, Exeggutor, are the only known Pokémon that can learn Barrage. Exeggcute debuts in Long Live the Nidoking! where it is scene as one of the Pokémon at Fuchsia City's Safari Zone and in the next round A Hollow Victreebel where multiple Exeggcute were captured by Red off-screen. Bill is seen with an Exeggcute in Pokémon Adventures. In Slugging It Out With Slugma it appeared again with its trainer when he was talking to Professor Oak, however it kept being a nuisance during the conversation along with Bill's Vulpix. Prior to the events of Volume 23, it has since evolved into Exeggutor. In Murkrow Row an Exeggcute is one of the many pokémon Gold owns at his house, it is noticeable that there are only five "heads" instead of six and none of them have any cracks. In The Last Battle XIII an Exeggcute was one of the Pokémon sent to help the fight in Ilex Forest. 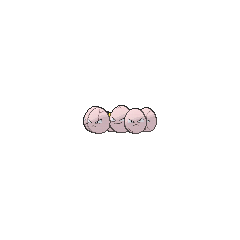 The more Exeggcute in the puzzle area, the more damage. 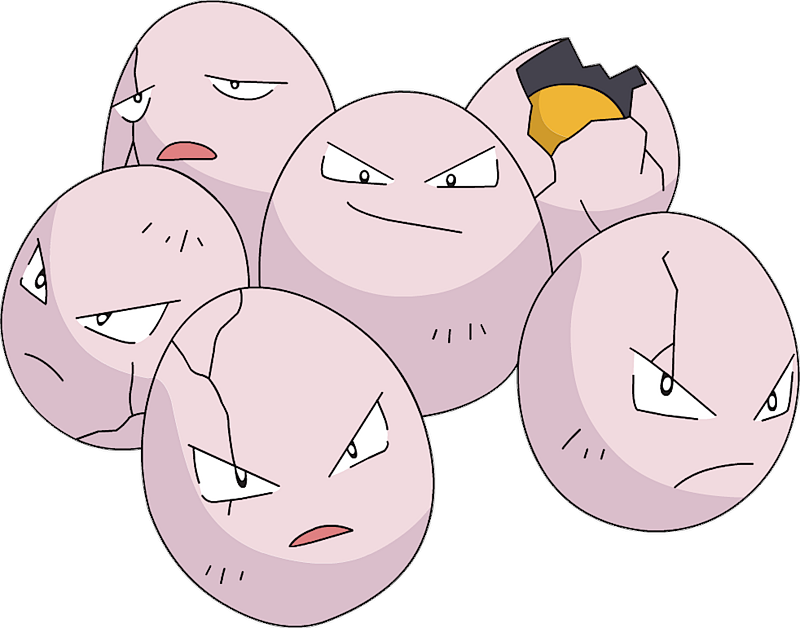 In Pikachu's Rescue Adventure, it is hinted that each of Exeggcute's members may have an individual sense of identity, even though they are all considered to be just one Pokémon. Exeggcute appears to be a mixture of a batch of eggs and seeds, though it may have been inspired by the "Egg Yolk" tomato or possibly a visual pun based on the eggplant. It may also be inspired by bird's nest fungi. Tamatama could be taken to mean 偶々 (unexpectedly), although it is more likely to be derived from 玉 tama (sphere). It is worth noting that the Japanese word for egg is 卵 tamago.